When Blood Oranges are in season if I need to make a dessert for any occasion, book club or work celebration (3/16? ), this is what I will make. A Flaky Blood Orange Tart. I found this recipe in Food and Wine. It has been on my Just Desserts Pinterest board for a very long time. I even broke my Lent fast of sweets to try this tonight. Perfect. The crust was flaky. The filling was sweet and tart. I loved it. I brought this for book club and I think everyone enjoyed it. I did not make the recommended Salted Caramel Sauce. I found Salted Caramel Gelato at Bishops! 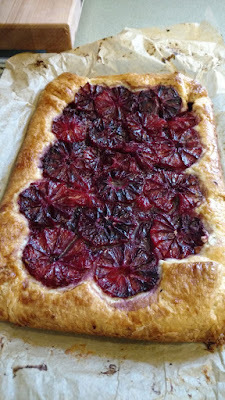 I doubled the crust and used more Blood Oranges than the recipe calls for because I was not sure how many people would be at book club and God forbid I should have to serve small pieces! I am pretty dedicated to my usual Pate Brise recipe for any pie and tart crusts. But I will use this crust recipe again. The dough was beautiful to work with. 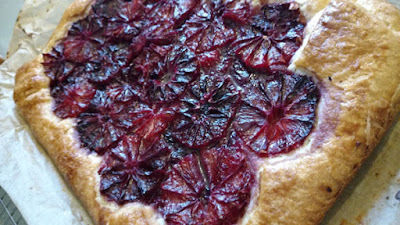 You do have to let the tart freeze over night so if you make this give yourself enough time. And another note - wear gloves when segmenting the Blood Oranges. My nails and cuticles are now blood orange! In a food processor, pulse the 1 cup of flour with 2 tablespoons of the sugar and the baking powder and salt. Add the stick of cold butter and pulse several times, just until it is the size of peas. Sprinkle the dough with the ice water and pulse just until moistened crumbs form. Turn the crumbs out onto a work surface, knead once or twice and pat the pastry into a disk. Wrap the pastry in plastic and chill for 30 minutes. On a floured work surface, roll out the pastry to an 11-inch round, about 1/4 inch thick. Transfer the pastry to a parchment paper–lined flat cookie sheet and refrigerate for 15 minutes, or until chilled. Meanwhile, peel the blood oranges, removing all of the bitter white pith. Thinly slice 2 of the oranges crosswise; remove the pits. Transfer the orange slices to a plate. Working over a sieve set over a bowl, cut in between the membranes of the remaining oranges, releasing the sections into the sieve. Remove the pits and gently shake out as much juice as possible without mashing the sections; you will need 1 cup of sections. Reserve the orange juice for another use. Arrange the orange sections on the pastry, leaving a 2-inch border all around. Sprinkle 2 tablespoons of the sugar over the oranges. Using a paring knife, thinly slice the remaining 1 tablespoon of butter over the oranges. Fold up the pastry over the oranges, leaving most of the oranges uncovered. Brush the pastry with the egg wash and sprinkle lightly with 1 tablespoon of the sugar. Arrange the orange slices on top, leaving a 1-inch border of pastry all around. Sprinkle the remaining 1 tablespoon of sugar on top. Freeze the tart until solid, at least 4 hours or preferably overnight. Preheat the oven to 375° and position a rack in the center. Place a baking sheet on the rack below to catch any drips. Bake the tart directly from the freezer for 1 hour and 15 minutes, until the fruit is bubbling and the pastry is deeply browned. Transfer the cookie sheet to a rack and let the tart cool for 30 minutes. 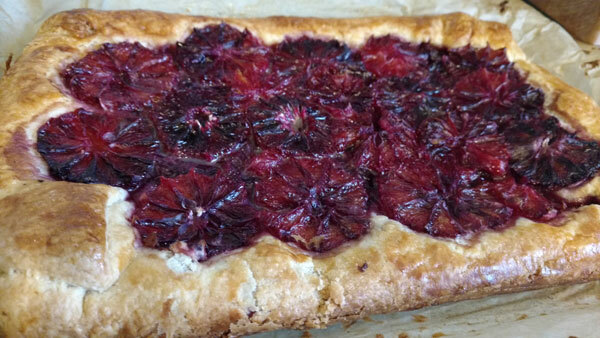 Carefully slide the parchment paper onto the rack and let the tart cool completely. Serve with the Salted Caramel Sauce. You can make this ahead of time. The unbaked tart can be tightly wrapped in plastic and frozen for up to 2 weeks. The Best English Muffins Ever!